ON-AN.com, Tor-Tor dance is a traditional dance from Batak tribe in North Sumatra. 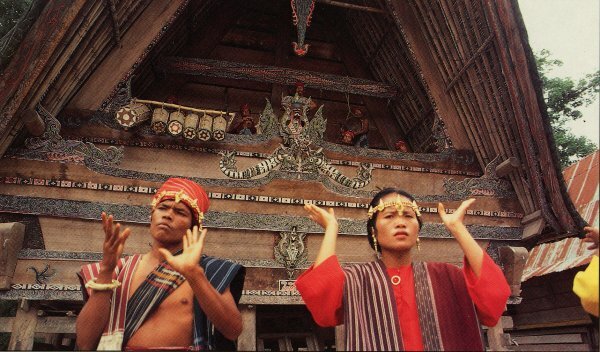 At ancient times, the art of dancing in Batak land was a main media during the rite, and it still had mystical things. Moreover, the dance was also performed in happy times like harvesting and wedding ceremony. According to history, tor tor dance is used in rituals associated with spirits. The spirit is invoked and “walked” into the stone statues, which was the symbol of the ancestors. Those statues were then moved like dancing, but with a rigid motion. The movement is identical with feet movement (tiptoe) and hand movements. There are 3 types of Tor-tor dance. There is Tor tor Pangurason (cleanup dance). This dance is usually held at a big party.Before the party starts, the place and location of the party is first be cleaned by using lime to be far from danger. Second, there is tor tor Sipitu Cawan (Dance of the seven bowls). This dance is usually held during the inauguration of a king. This dance is also derived from the seven daughters of heaven to bathe in a lake at the top of the Pusuk Buhit mountain along with the arrival of piso sipitu sasarung (the seven knife sheath). Last, there is tor tor Tunggal Panaluan, which is a cultural ritual. This dance is usually held when there is disaster strikes the village. Tunggal Panaluan is danced by the shaman to be guided solutions to resolve the issue. The moves of Tor tor dance is flows according to Margondang, which is the traditional instruments that accompanying the dance. These instruments are Gondang or percussion, Batakness trumpet and more. Today, the ritual of Tor tor dance is no longer associate with the religious rite or any mystical ceremony but the occasional events like welcoming tourists and wedding feast.